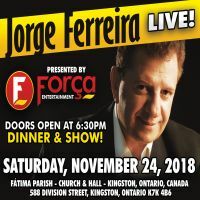 Jorge Ferreira has been called the “Portuguese Elvis” and he’s bringing his live show, dinner performance to Fatima Parish on November 24th. Tickets are $50 and include dinner and the show. For more information on this event, please check the link below.